Tuberculosis (abbreviated as TB for Tubercle bacillus or Tuberculosis) is a common and often deadly infectious disease caused by mycobacteria, in humans mainly Mycobacterium tuberculosis. Tuberculosis usually attacks the lungs (as pulmonary TB) but can also affect the central nervous system, the lymphatic system, the circulatory system, the genitourinary system, the gastrointestinal system, bones, joints, and even the skin. Other mycobacteria such as Mycobacterium bovis, Mycobacterium africanum, Mycobacterium canetti, and Mycobacterium microti also cause tuberculosis, but these species are less common in humans. Tuberculosis is spread through the air, when people who have the disease cough, sneeze, or spit. One-third of the world's current population has been infected with M. tuberculosis, and new infections occur at a rate of one per second. However, most of these cases will not develop the full-blown disease; asymptomatic, latent infection is most common. About one in ten of these latent infections will eventually progress to active disease, which, if left untreated, kills more than half of its victims. The proportion of people in the general population who become sick with tuberculosis each year is stable or falling worldwide but, because of population growth, the absolute number of new cases is still increasing. In 2004, mortality and morbidity statistics included 14.6 million chronic active cases, 8.9 million new cases, and 1.6 million deaths, mostly in developing countries. In addition, a rising number of people in the developed world are contracting tuberculosis because their immune systems are compromised by immunosuppressive drugs, substance abuse, or AIDS. 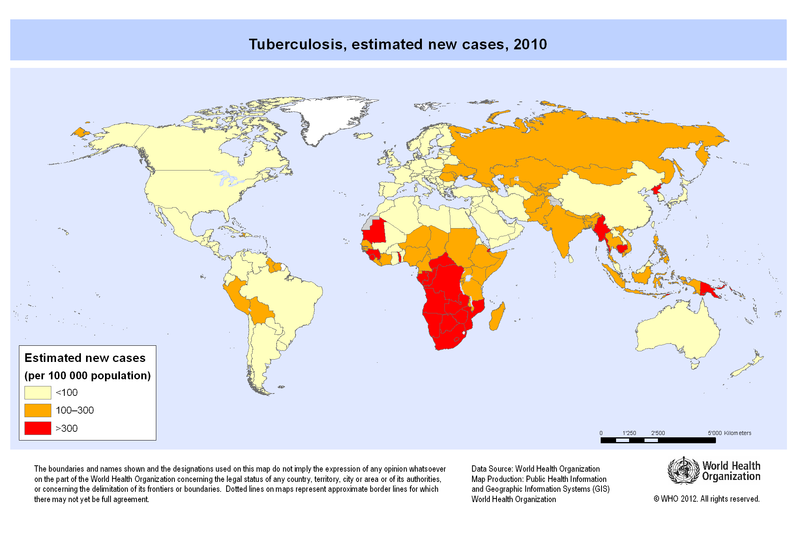 The distribution of tuberculosis is not uniform across the globe with about 80% of the population in many Asian and African countries testing positive in tuberculin tests, while only 5-10% of the US population test positive. It is estimated that the US has 25,000 new cases of tuberculosis each year, 40% of which occur in immigrants from countries where tuberculosis is endemic.